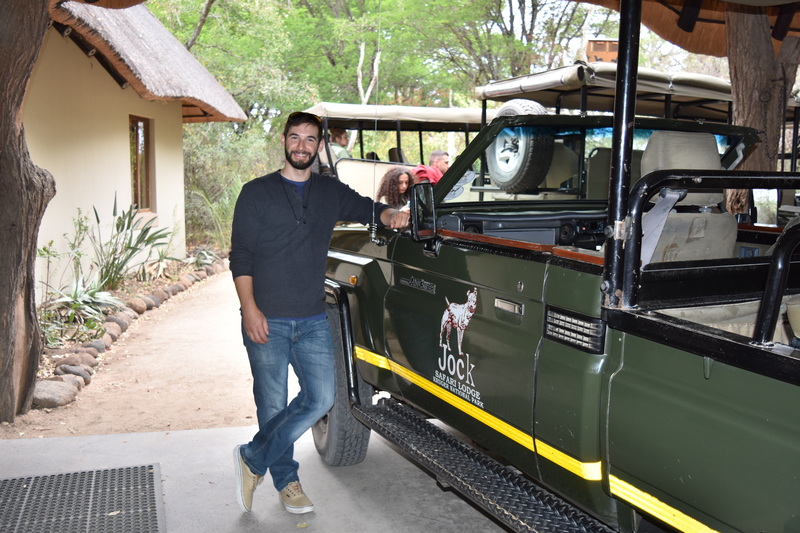 Each day of our three-night stay at Jock Safari Lodge began the same way. 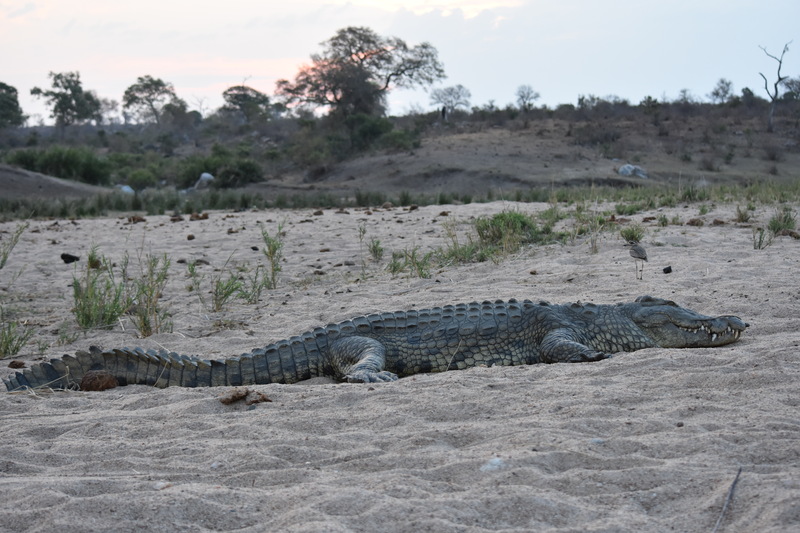 We awoke at 5 am to a call from Lazarus (Laz for short), our safari ranger for the duration of our stay. From that point we had 30 minutes to get out of bed and get to the green open-air Toyota Land Cruiser where Laz was waiting. With our eyes barely open we threw on the safari outfits we’d carefully picked out a few weeks before–breathable outerwear to keep us cool (which we’d learn would not be a problem on safari in September) and cover us the strong African sun and the persistent, (possibly) malaria-carrying mosquitoes. 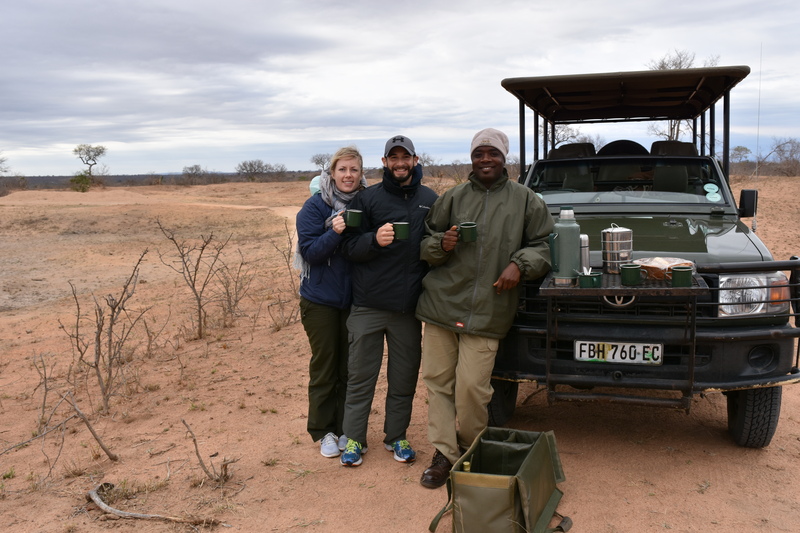 We’d step out of our room, spray ourselves down with bug repellent, head to the dining room for a quick cup of coffee* and a snack, and get going on the first of two three-hour game drives that day. *On the advice of a friend who had been on safari in South Africa a few years before, I made a point not to have too much caffeine before we left. You don’t want to be the guy, my friend warned, who makes the ranger turn back so you can use the bathroom in the middle of a drive. *These days, TB5 is essentially a marketing campaign, a brand, even. From the airport gift shop to the hundreds of small shops in between Kruger and Johannesburg and Cape Town, TB5 adorned kitschy souvenirs, from placemats to postcards. There’s also some historical context around TB5, as Laz explained to us one night over dinner: When European hunters would come to Africa to hunt dangerous and rare game, many were killed attempting to fill their trophy room with heads and hides. Laz says it wasn’t uncommon for European hunters to have safari tales about how a buffalo, or a rhino, killed one of their family members or friends. Sure enough, about 30 feet from our car was an adult African elephant. My wife, perhaps without realizing it, exclaimed “Oh my word!”–simultaneously channeling the wonderment of a 5-year-old and the phraseology of a 90-year-old. But I can’t blame her, because that’s why we were there: to see things we’ve never seen before, and see them up close. And we were off to a pretty good start. But as exciting as it might have been to see that first elephant, Laz made sure the full Jock experience was worth the price of admission–and a massive upgrade from casual cab-side animal spotting. Laz was undoubtedly looking for and finding clues that were going right over our heads. He would examine dung and tracks in the sand, listen for birds tipping off the location of land animals, scan the horizon for movement hundreds of yards away, and I imagine he was doing things we didn’t even realize, like smelling for clues. Even when it got dark, and the rest of us could barely make out an elephant if it was charging the vehicle, Laz was pointing out tiny rodents climbing up trees with nothing but a flashlight he waved back and forth in front of the truck like a windshield wiper. Laz and his fellow rangers–usually three or four trucks went out at a time–would communicate on the radio to let each other know if they spotted something that was worth taking their passengers to see. To be honest, I didn’t want to know how Laz was so good at his job. I thought of him as a safari magician. Telling me how he does the tricks would only detract from the experience. 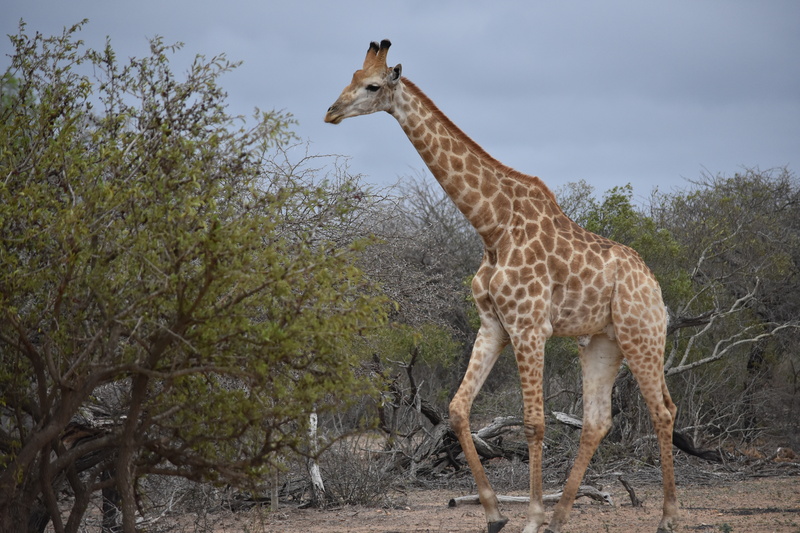 Of Kruger National Park’s (KNP) 7,523 square miles (about the size of Israel), Jock had exclusive rights to game drives on 23 square miles, and could also track game on any public land within KNP. 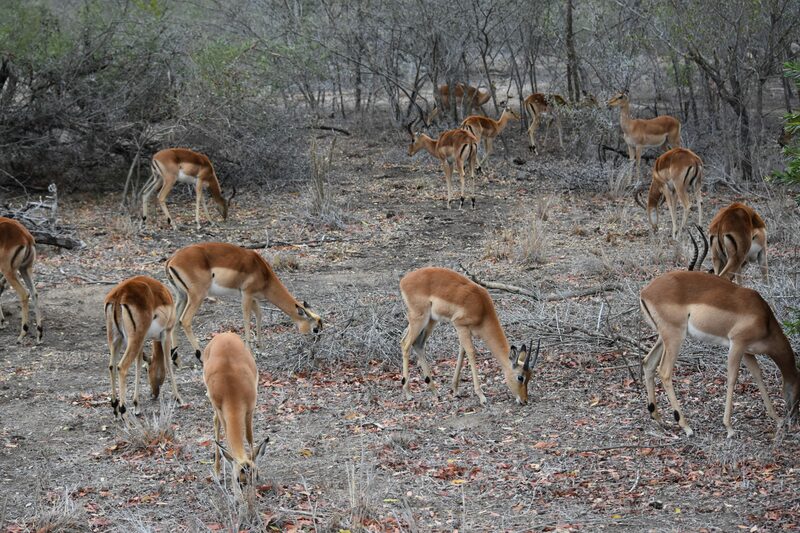 While some animals, like cheetahs, are very rare in Kruger, others, such as impala, were everywhere. * The rangers call impala the fast food of the safari because a) they’re plentiful for any predator looking for an easy meal, b) they run fast, and c) the markings on their back side look a lot like an “M,” which might remind you of the golden arches of McDonald’s. *There are about 150,000 impala in KNP, versus about 150 cheetah. Oddly enough, we saw 3 cheetahs at once–or 2% of the total cheetah population in KNP. Elephants were fairly easy to find as well, both because they’re one of the more populous animals in the park (about 14,000 in KNP), and they’re huge. We were fortunate to see this scene a few times. We even had an angsty teenage elephant take a few threatening steps towards our truck and trumpet at us, before losing interest. About an hour into our morning drives, Laz would pull over in a safe-ish part of the park, pull down a little metal shelf attached to the front of the truck, put down a safari-patterned tablecloth, and set up a coffee and cookies for his passengers–my wife and me, a 40-something German couple, and a 30-something Swiss couple. He would carefully scoop two spoons full of instant coffee into each mug (ours first, then his once we all had a cup), the hot water from the Thermos, and even a splash of milk. (He also offered Amarula, a cream-fruit liqueur, if we preferred.) We would stand around the truck, sometimes asking him questions, other times just enjoying the quiet. What I enjoyed most about these little coffee breaks–besides not being at my desk at work–was that they forced us to stop, look around, and appreciate how lucky we were in that moment. 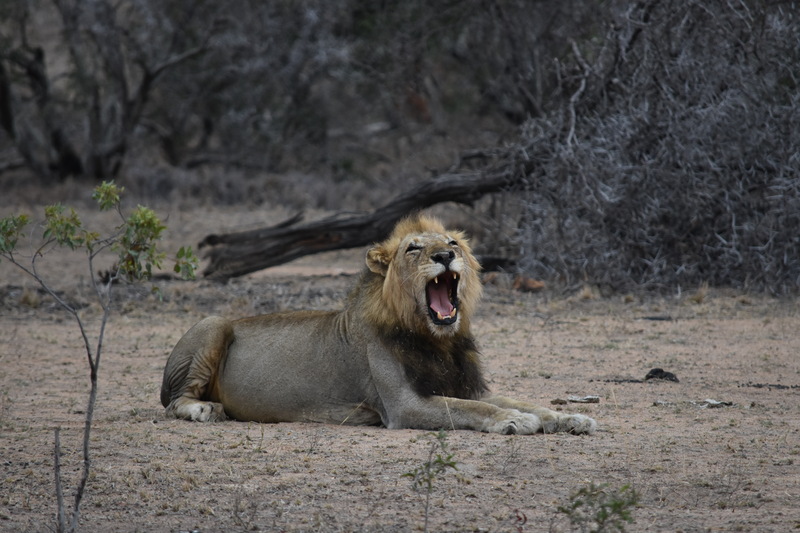 A few minutes after the coffee break on our first morning out, and not too far from the “safe” spot we were casually drinking coffee, we stumbled upon an adult male lion napping–our first lion sighting. While we certainly hoped to see more than just one lion, I think everyone in Laz’s truck silently checked off “lion” on their TB5 mental Bingo card. 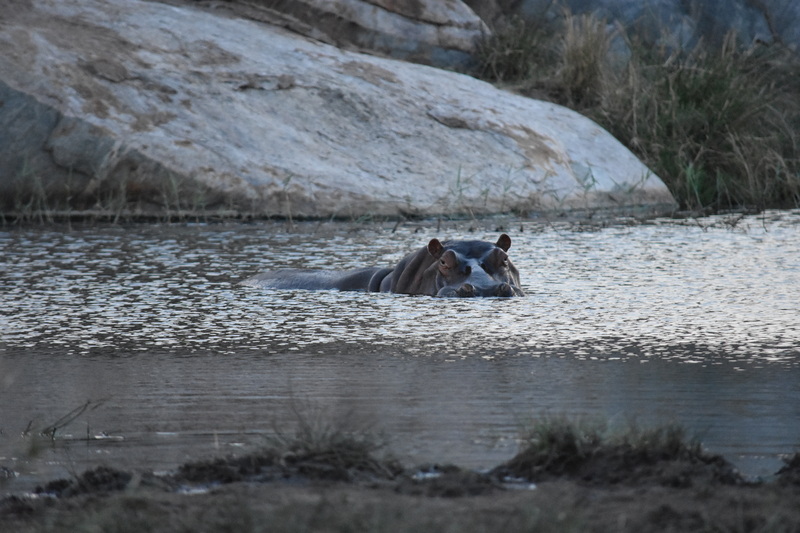 In the water was a bashful hippopotamus who barely poked her head out a couple of times, enough for us to snap a few photos. Laz explained that hippos, despite being vegetarians, were actually the #1 human killers in Africa. * While not carnivorous, they’re very territorial. It doesn’t take much, just a poor soul in rural Africa washing up in some water, to motivate a hippo to defend her territory by crushing its perceived threat. That night, we ate a boma-style dinner with our fellow drive passengers and Laz. When my wife asked him what a boma was, he explained its original was the “British Officers Mess Activity.”) He then explained that he was lying*, and that a boma was actually a traditional African meal in which a large group of people cook, eat and then go to sleep around a large fire. The boma buffet menu included kudu (very tender beef-like meat), buffalo pie (like shepherd’s pie) and sausage, warthog (tasted like chicken but gamier), plus some chicken and beef. I made a point to taste everything. We spent our last three drives chasing a leopard. When we arrived, the leopard wasn’t home. Laz thought he wasn’t far off, but now that we were on a public part of Kruger (as opposed to Jock’s exclusive land) there was a lot more tourist activity and the leopard wasn’t having any of it. We hung around for a bit, but the leopard never appeared. Before our second attempt at spotting the leopard–see what I did there?–Laz suggested we try to track down Jock’s local pride of lions. (Think of it like the local chapter of an Elks Lodge, but, ya know, nothing like that.) I think he was hedging his bets that if we didn’t end up seeing the leopard that night, we’d settle for a bunch of lions. Perhaps just to build up some drama, Laz stopped the vehicle in the middle of the arid river bed, took his rifle out of its case for the first time since we’d been there, and started walking towards the other side of the river bed, where he’d have a better view of the landscape. As my wife started to snap a few pictures of Laz walking away, he turned, and with his fake serious expression and tone of voice, said, “If I don’t make it back, send that picture to my kids and tell them I love them.” Then he smiled, and kept on walking. He returned a few minutes later with the data he needed, and we were off to find the pride. Most of our animal-spotting had been done from the side of the road, but the lions weren’t going to make it easy for us to see them. Laz pulled the Land Cruiser off the dirt road, warning us to duck our heads as we drove in between gangly trees and over dead branches to get a closer look. And just like that, there they were: 12 male lions. While the older male lions–the ones who had facial hair, a.k.a. manes–conserved their energy, the younger ones did battle. Against each other. 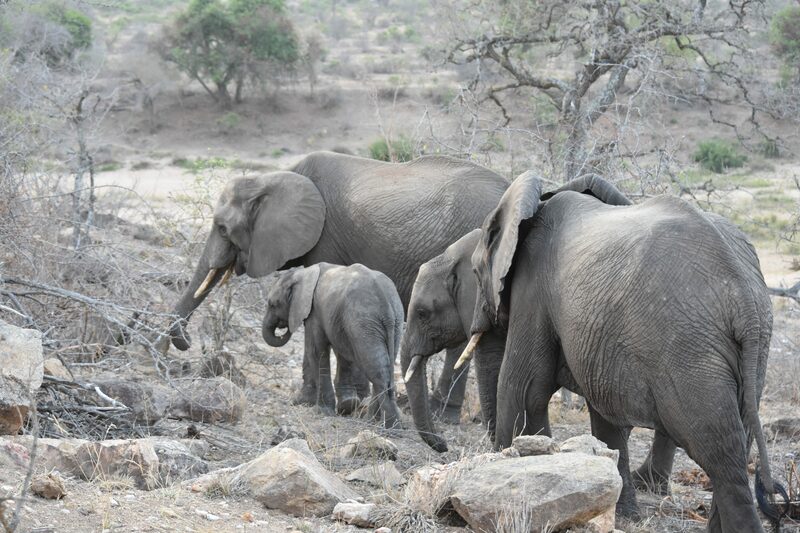 My biggest takeaway from the safari is that animals are deliberate about how they use their time and energy. Everything they do is purposeful. For the older lions, napping was the best use of their time in that moment. But for the younger ones–think teenage Simba*–they were using the time to practice. *Laz referenced The Lion King quite a few times on the trip, referring to warthogs as “Pumba,” or a mountain as “Pride Rock,” or working “Hakuna Matata” into the conversation. The Lion King, he said, was a common language among any of his guests, regardless of where they came from. 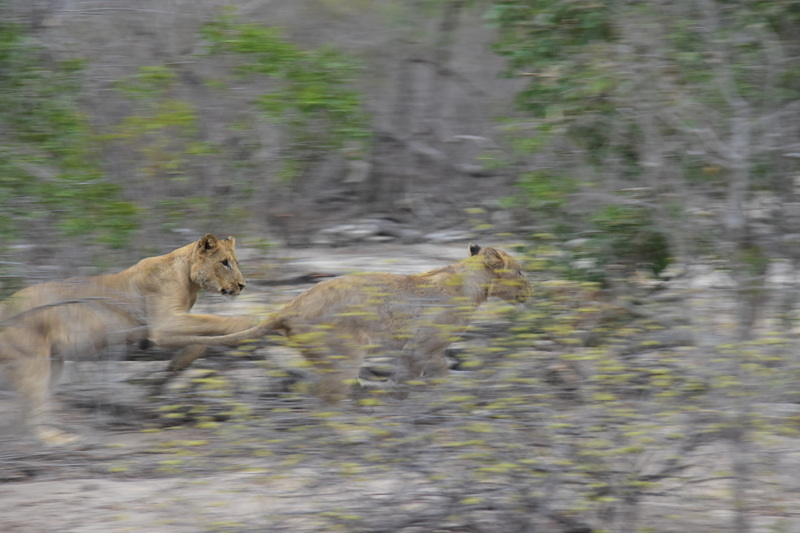 The young lions, three or four of them, took turns walking away from each other, stalking slowly, and then running at and pouncing on one another. Once a lion was pounced on, a short wrestling match would ensue, and then another lion would start it all over again. It was remarkable how clear it was what they were doing, and how relatable it was to the behavior of human boys playfighting in the schoolyard. As for us, we scored tons of pictures and video, and this sighting made our safari trip. Even if we never got a glimpse of the elusive (and quite frankly, rude) leopard, we had our lions. At that point we were playing with the house’s money, so Laz took another shot at finding Cousin Jeffrey’s favorite animal. It was about a half hour drive from to the leopard’s refrigerator (a.k.a. the tree where he was storing his impala), and it was already dark by the time we got there. Laz shined his flashlight around the tree, and sure enough we could just barely make out a glimmer of the leopard’s eyes catching the light, betraying his location behind a bush directly beneath the tree. It was only a matter of time, we thought, before he came out of hiding, climbed up the tree, brought it down and started feasting. But, as it turned out, a faint outline of the leopard behind the bush was the best look he’d allow. With not much going on except us starting at a tree illuminated by a flashlight, Laz took the opportunity to serve our puza, or safari happy hour. (I asked him if puza, like boma, had a special meaning in African culture. “It means drinking.”) The leopard never came out of hiding, but at least now we had booze. That night we went back to the lodge, recapping the day with the older German couple from Laz’s truck, and a younger German couple who were part of a different group. The younger Germans happened to be at the right place at the right time the day before, and actually had photos of the very same leopard we were chasing, bringing his kill up into the tree. Timing is everything on safari. Still, despite a mild case of FOOMOS (fear of missing out on safari), we were satisfied with the day’s drives and Laz’s efforts to give us a special experience. On our final drive the next morning, we went directly to the same spot, hoping the leopard would seize the opportunity to dine in peace–besides the minor distraction of being there creepily watching him. But by the time we arrived the carcass was gone. He’d either eaten it and then the rest had been taken by scavengers, or more likely he had moved the stash. I’d hardly say we’re disappointed by the leopard’s shyness, thought it would have been cool to see the last of our TB5 animals in action. But, as a fellow tourist told us a few days later at our next step, Cape Town, you don’t want to see everything a place has to offer on your first visit. Now you have an excuse to return. The male red-crested korhaan (a.k.a. “the baby ostrich”) has a unique mating ritual. To advertise its mad flying skills to its female counterparts, it performs an aerial display. The kurat shoots itself up into the air like a rocket, hits the peak of its flight, then drops like a rock down to the ground before parachuting its wings just a moment before landing. Speaking of mating rituals, male rhinos defecate, then stamp on it track it on the ground around them to denote their territory. 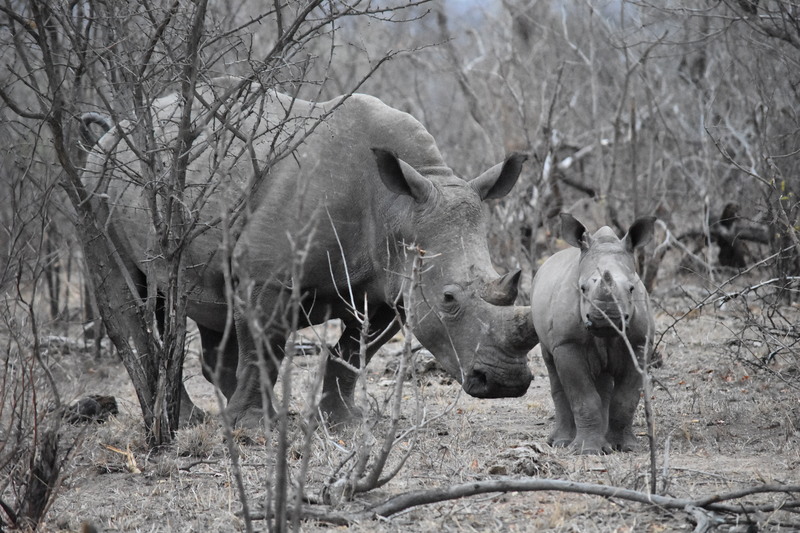 Female rhinos catch the scent, then they defecate nearby to advertise their own availability. We often spotted large dirt mounds around trees. Our nature guide explained that these were termite mounds. Termites don’t actually eat wood. They eat mushrooms. So, they create these soil piles, under which mushrooms–and ultimately the trees themselves–grow. 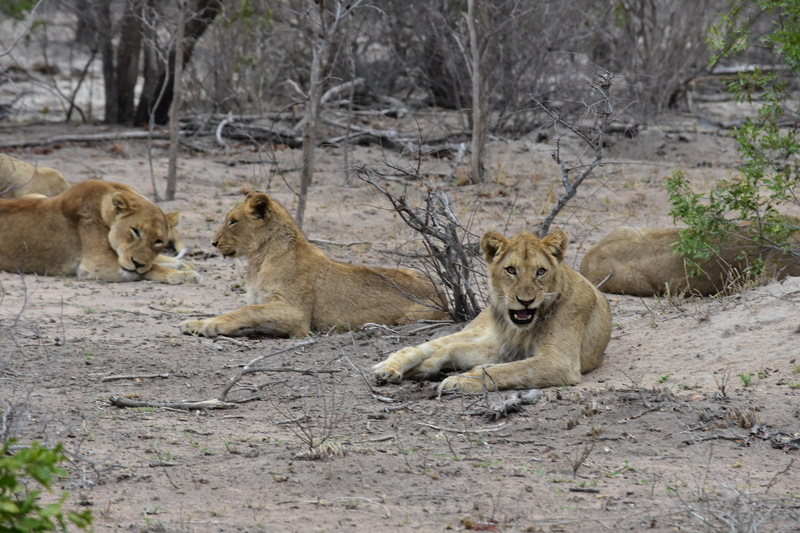 On one drive we saw four or five male lions lazily sunning themselves, bellies up. Laz explained that they had just eaten a big meal, and turn their bellies up toward the sun because it apparently aids their digestion. Sounds like an old wives’ tale to me, lions. Can’t wait to read the rest! I know how you enjoy Kim’s cute phrases. I’m sure that the utterance of “oh my word” added to the fun of the trip! Delighted for this first hand account,felt like I was there. Also loved some of your catch phrases.